What does it mean to live past the age at which a loved one died? We are guided and shaped by the important people in our lives, both by their lives and by the confusion of losing them. In two years I will be 45, the age at which my late husband, the most profound influence on my adult life, passed on. Even now I wonder what it will mean to live past the age he attained. How do we grow beyond what our mentors could offer? I am not the only one to note the significance of an age. 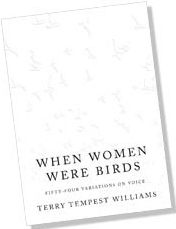 “I am fifty-four years old, the age my mother was when she died” begins Terry Tempest Williams in her new book, When Women Were Birds. Her mother had pointedly bequeathed her two shelves of journals, mentioning them in a conversation they had shortly before she died. The journals, when opened, were blank. Barely 30 at the time and overwhelmed with “sharp and ragged grief”, Ms. Williams tucked this story away, “deeply in the soles of my feet,” as she puts it, without giving this mystery much thought. More than 20 years later, her most recent book explores what her mother could have meant by the blank journals. Subtitled “Fifty-Four Variations on Voice,” she describes this book as an ongoing conversation with her mother and grandmother, women whose voices continue to guide her long past their deaths. I read this book slowly, looking for answers, savoring its lyrical sound and feeling the questions it roused in my own mind. Ms. Williams’ expressive, non-linear way of writing stirred up memories of my life while I read stories about hers. Asked how she developed this style, she responds “…it rises from the poetry of our lives”. I read it the way one might read an extended poem, reading a chapter or two and letting it rest, sifting it through my own experiences. Every chapter, long or short, continued the conversation in my mind. I responded to some statements with disagreement or with wonderment. Others resonated deeply, reminding me of the mentors in my life and my own experience of voice. This says to me that our voices are one more way we carry our experiences and express who we are. In this way, we carry our living influences and carry our dead too. Upon finishing the book, I tried to sum up the theme. I thought it was about about finding the courage to speak and said so in our email interview. Ms. Williams says it better. How do we grow beyond what our mentors could offer? The answer is in the telling of the story. It’s in that authentic center and in the journey we take to find it, following in the footsteps first of one, then another, until we find ourselves. Disclaimer: The publisher, Macmillion, kindly provided a complementary copy of When Women Were Birds. All opinions are 100% Bonnie Simon’s. I so love this book – there are deep meanings hidden in the shadows of the words , where they touch your heart and stir your mind.